At Vista Church, the love of Jesus compels us to love and serve the community around us in meaningful and tangible ways. Start a new neighborhood tradition this Christmas! Invite your neighbors to join your family for a short, fun, and meaningful celebration of how God came to us, born as the baby Jesus. Your neighborhood will enjoy coming together to watch the Christmas story acted out by their very own children. Click HERE for the Neighborhood Nativity Play Handbook. Email andrew@vistachurch.com to reserve a set and costumes for your Neighborhood Nativity Play. God calls us to love others with our actions and deeds, not just our words. This happens in our church community all the time, but, twice a year, we come together as a church to serve our schools, community organizations, neighbors, and families in need. 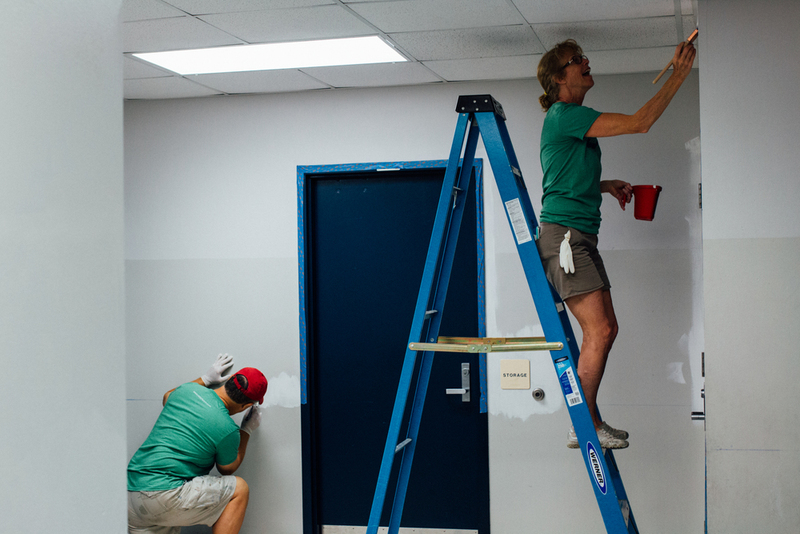 We clean, paint, organize, mow, trim, and build in the name of Jesus to be a blessing to others. If you need help or know somebody we could serve, contact andrew@vistachurch.com. RSVP to the next Vista Serves on September 30th HERE. Jesus knew what it was like to be in need. Are you in need of food? If you are unemployed or underemployed and in need, our Food Pantry provides groceries as an expression of Jesus Christ’s love for you. The Food Pantry is open on Tuesdays from 2:30-3:00 pm at Vista Community Church. For more information, call 407-306-8000. If you would like to be a part of this team, please contact debbie@vistachurch.com. We believe that families and children matter because Jesus believes that families and children matter. Throughout the school year, we are looking for ways to bless our neighboring schools: Hidden Oaks Elementary, Pinar Elementary, Liberty Middle, Odyssey Middle, Colonial High, and Lake Nona High. We've given backpacks at the beginning of the year, cleaned up school property, and provided mentors & student leadership opportunities through organizations like Kids Hope USA, Cru, and First Priority. If you have an idea of how we can bless one of our schools, please contact andrew@vistachurch.com. We partner with Kids Hope USA and Hidden Oaks Elementary to help at-risk children in our neighborhood. Kids Hope USA Mentors spend one hour each week reading to, talking to, playing with, and listening to a student at Hidden Oaks. By helping the student feel loved and valued, they help that child to learn, grow, and succeed. Kids Hope USA Prayer Partners pray each week for one child, one school, and one mentor. You can change a life...and that's no small change. We believe that we are more like Jesus when we love and serve those who are in need. We support and team up with Jobs Partnership to help transform the lives of the chronically underemployed by developing the skills they need to get ahead. The Jobs Partnership LifeWorks class is a 12-week course, based on biblical principles, that provides job training, personal coaching, and new career opportunities for the underemployed. If you would like to apply for the LifeWorks class, visit www.JobsPartnershipFL.org or call 407-641-0755 x101. If you're interested in volunteering at a LifeWorks class, check out these volunteer opportunities and sign up at www.JobsPartnershipFL.org. We see our facility as a gift from God. We want to use it in whatever way we can to help build our community and make it a better place. God has led us to use our building as a voting site for two local precincts. We also host a variety of homeowner's association meetings, school concerts, and periodic health fairs. Enrich your lives and those of an UCF International student by serving with Bridges as an American Friendship Partner to one of the 120 students who have asked to have a relationship with an American individual or family. The commitment is at least one interaction a month during the 2016-17 school year. It's a lot of fun! or by texting "amfriend" to 85005.
or Email us at BridgesUCF@gmail.com.